Bry-Air has wide range of proprietary chemical media for Gas Phase Filtration to eliminate corrosive, odorous and toxic gases from Industrial and Commercial environment. BRYSORB™ series offers range of combination of Activated Carbon and Activated Alumina impregnated with various impregnates which neutralizes various gaseous contaminant such as H2S, SO2, Cl2 and NH3, and widely used for gas phase filtration. BRYSORB™ 508 granular media is an Activated Alumina impregnated with Potassium Permanganate (KMnO4). BRYSORB™ 508 chemical media is used to remove a variety of contaminant gases from air in hostile industrial environment such as Hydrogen Sulphide (H2S), Sulphur Dioxide (SO2), Sulphur Trioxide (SO3), Nitric Acid (HNO3), Formaldehyde (CH2O) Ethylene (C2H) and Aldehydes (-CHO). BRYSORB™ 508 blend granular media is an Activated Alumina impregnated with Potassium Permagnate and other proprietary chemicals (KMnO4). A perfect blend of BRYSORB™ 508 and BRYSORB™ 520 for optimum removal of harmful and odourous gases such as Ozone(O3), Hydrogen Flouride (HF) and various other VOCs. BRYSORB™ 515 granular media is an Activated Alumina and Activated Carbon impregnated with Potassium Hydroxide (KOH) for effective removal of Chlorine (Cl2) and Sulphides (SOx). 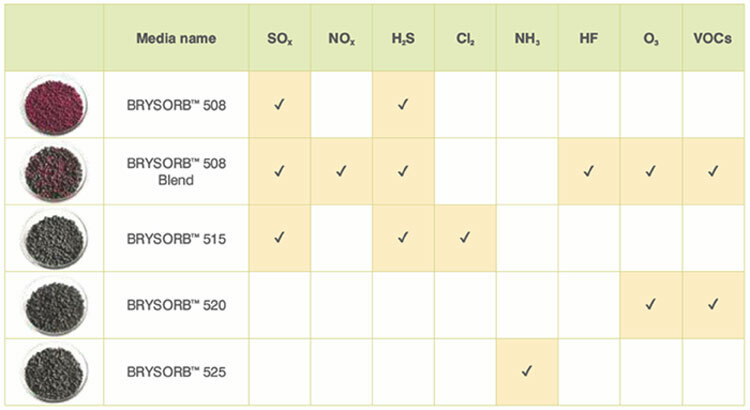 BRYSORB™ 515 chemical media is basically lowering or raising of the pH to a neutral condition with a change of state from a gas to a solid, stable salt. This is good to remove gases such as Hydrogen Sulphide (H2S), Sulphur Dioxide (SO2) and Chlorine (Cl2). BRYSORB™ 520 granular media is pure Activated Carbon. This is neutral in nature. BRYSORB™ 520 is the media in which one substance gets attracted and adheres to the surface of another. Atoms & molecules are held to gather in a solid by physical forces, as strong as vakence (chemical) bond and as week as Van-er-Waal’s (physical) attractive forces. This remove toxic gases such as Chlorine (Cl2), Nitrogen Oxide (NO), Carbon Disulphide (CS2), Toluene (C7H8), Isopropylalcohol (C3H8O) and trichloroethene (C2HCl3). BRYSORB™ 525 granular media consist of cylindrical, porous pellets formed by combination of Activated Carbon impregnated with Phosphoric Acid (H3PO4) for effective removal of Ammonia (NH3). Bry-Air offers latest technology in gaseous adsorption – Gas Phase Activated Carbon process which greatly increases the adsorption capacities of Activated Carbon. The Phosphoric Acid (H3PO4) impregnation is done in such a way to ensure uniform distribution across the entire volume of pellet so that the target gas will react with chemical media. The chemical media used in chemical filter is consumable and cannot be regenerated Therefore it has to be replaced whenever consumed. Determining the time of replacement is important so that media is not replaced when its life is left or we keep on using the system once the chemicals are consumed also. Bry-Air has in-house lab to ensure that the media is checked at regular interval and changed at appropriate time. Bry-Air provides you the facility to check the “life” of chemical media free of cost. Just send us the sample of the chemical media to us and we will let you know the life of chemical media.